Welcome back everyone ! 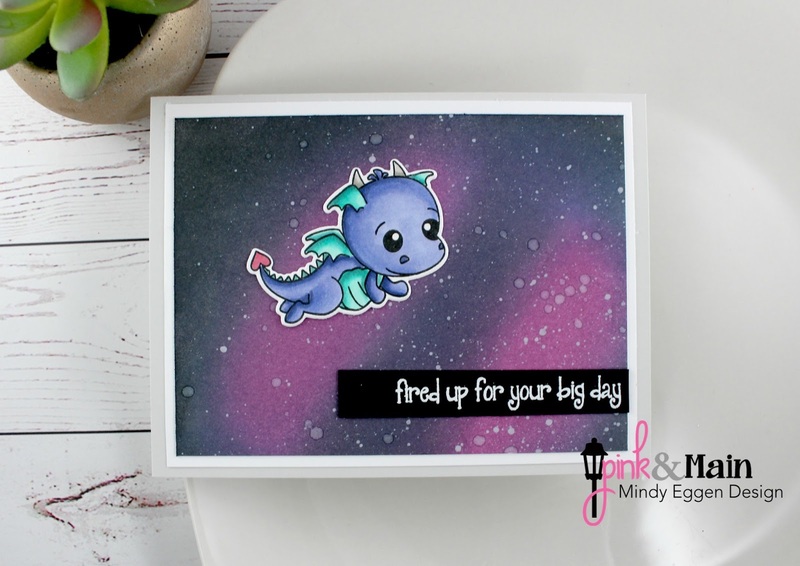 I combined two of my favorite things … dragons and a galaxy background. 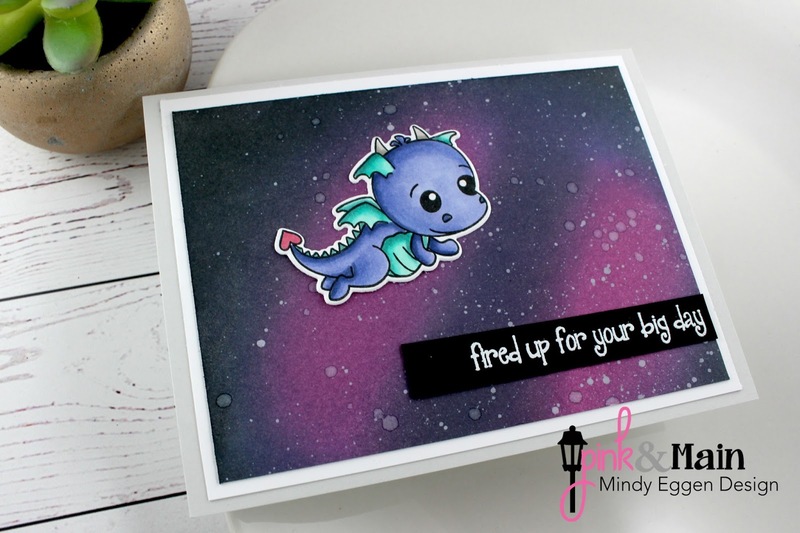 For my card, I’m using the Fired Up stamp set from Pink & Main’s latest release. I stamped my image onto Neenah white cardstock 80lb with a copic friendly ink and colored with my copic markers. Then I used the coordinating die to cut the image out . I created my background by ink blending Picked Raspberry, Wilted Violet, Blueprint Sketch and Black Soot distress oxide ink onto Bristol Smooth cardstock. I spritzed with water and dabbed up with a paper towel. Then I took some white paint and a little dab of water onto an acrylic block, mixed and flicked the mixture onto my card with a paintbrush. My card base is a piece of light grey cardstock. I trimmed a piece of white cardstock down to 4″ x 5 1/4″ and layered my galaxy background on top of the white panel. I think this helps the galaxy stand out more. My sentiment is also from the Fired Up set in which I white heat embossed onto black cardstock and trimmed down. Then I just adhered everything to my card front. 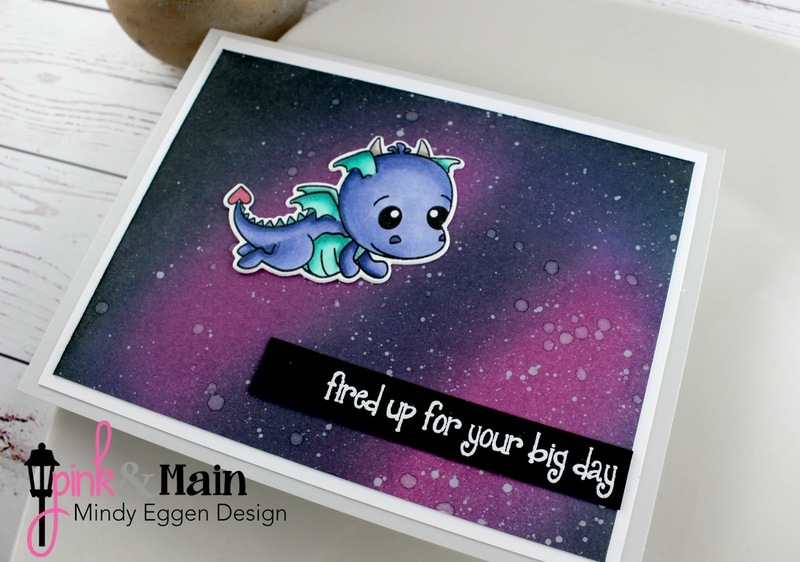 I’m such a fan of dragons and galaxy backgrounds so I was super excited how this came together.